Last minute scrambling to crank out another blog post is hardly the origin story for most great content. Falling behind on content production happens for a variety of reasons from poor planning to lack of resources. Solutions will vary, but one thing I’ve found that helps with the creation of quality content on a consistent basis is a combination of efficiency and creativity. Process and technology are a certainly a big part of efficiency but so is thinking beyond your own capabilities (creativity). 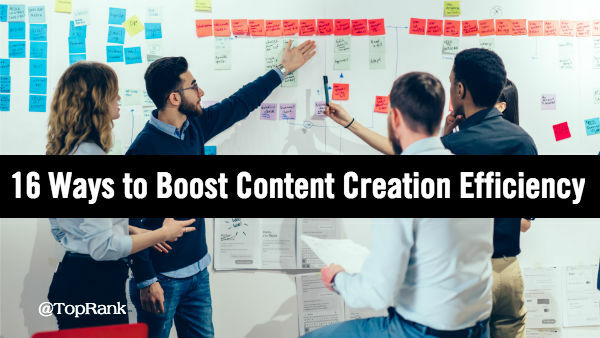 Knowing you should do a thing and being able to do it well are not the same thing, so while some of these types of ideas are familiar, it is in their implementation that you’ll find new content creation productivity. I share these tips from a place of personal experience. During my blogging journey of writing over 1.4 million words on this blog over the last 14+ years, I’ve learned a few things about being efficient and effective with content creation. Social Networks provide an incredible opportunity to attract and engage likeminded people. Once you have developed any kind of network this way, you can crowdsource content around your mutual interests. How, you ask? Once you’ve conducted the series of polls, you can use them as the basis for a blog post. 2. Survey Your Customers. Another opportunity to connect with others for the purpose of content creation is to run a survey with your customers. You can ask questions that line up with early, middle and late stage content From trends to tactics to testimonials, customer surveys can yield an array of insights and content for your marketing. A great example of this is the Annual Content Planning Survey that we help DivvyHQ with. In 2017 a survey was conducted with customers and insights from that research inspired a series of 4 content marketing campaigns. The program went so well, we launched the 2018 survey (with excellent initial results) which will inspire a sequence of campaigns as well. 3. Invite Employees to Share FAQs. Staff in customer service and sales are on the front line of answering customer questions. This exchange of information process is a goldmine for understanding what matters to your customers and to sourcing content for marketing. Ways to capture the frequently asked questions of customers can vary from informal surveys with a selection of support or sales staff to setting up a way for those staff to bcc marketing whenever they answer a particularly popular question. Challeng your customer support and sales staff to harvest these exchanges and be sure to let them know when you’ve used something that they contrbuted to reinforce the activity. 4. Run Contests Where Content is Required to Enter. Virtually everyone with an internet connection is empowered to create content. People with interests have all the tools they need to share what they’ve made with likeminded network connections and that spells opportunity for brands. Where contests come in to play is where a brand’s community is invited to share their opinion or expertise in an area of mutual interest to the brand and its customers as a form of entry to a contenst. The reward could be “fabulous prizes” but recognition amongst peers willl be just as powerful. 5. Shoot Videos and Transcribe to Text. Video is the hottest format for content marketers and customers alike right now. While video is popular, text hasn’t disappeared as a preferred format just yet. With so many companies creating video, the opportunity to repurpose that content as text can’t be missed. 6. Use Video Stills as Blog Post Images. Another way to leverage your investment in video creation is to take still images from the video and use them as images for the text content that you transcribed from the video. In fact, depending on the subject matter, you might be able to use still images from videos as a source of stock photography for your content marketing efforts. 7. Do Interviews and Repost Combined Answers. One of my favorite examples of repurposing content is to conduct a series of interviews with experts in a particular field. Some of the interview questions would be the same for each person interviewed. After publish each full individual interview, you can take all the answers to certain questions from each interview and create new content with it. This makes it easy to repurpose and gives the interviewees additional exposure after the initial interview published. 8. Reuse Curated Tips, Stats, Quotes as Ingredient Content. Another one of my favorite techniques for repurposing content is to first establish a process and routine of harvesting microcontent and saving it using keyword tags. Microcontent like short tips, inspirational quotes and statistics from research have a common use for many marketers in the form of social shares. When you create a taxonomy of BATs “best answer topics” it can guide which microcontent to use. When saved and categorized in a spreadsheet or database, it becomes easy to reuse that content in other forms: newsletters, blog posts, presentations, infographics, listicles, ebooks/guides, motion graphics, and so on. 9. Ask Many Influencers One Question for a Tip. Rather than viewing working with influencers for content as individual tactics, the most productive approach is to identify opportunities to collaborate and grow an relationship. Content is both a means for engaging influencers and an outcome from the relationship. To start, identify and qualify a list of influencers around one of your BATs (best answer topics). Then, reach out to them with an easy, relevant ask: share one tip or piece of advice. It works best if you alrady have at least one well-known influencer on board so you can share for credibility as wel as specs, due date and an example. 10. Follow Up with a Bigger Ask, Interview. Once you’ve asked your influencers for a tip and published the content, it’s time to follow up with are more substantial request. The simple ask should have created a positive experience for the influencer: easy effort on their part and high value, relevant exposure in return. Now go back to the influencers that were the best to work with and most effective and invite them to contribute something longer form. It might be a multi-question interview, an introduction to an ebook, or a thought leadership piece for an article. 11. Connect with Influencers in Real Life. While not required, it can mean a lot to reinforcing the strength of your budding influencer relationships if you are able to connect in person. Industry conferences are a common opportunity to do this. A brand might also invite influencers to it’s own event or something dedicated to the influencers and some of the brand’s customers. Discussions can be “liveblogged” and leveraged as thought leadership content for the brand. 12. Collaborate on Content Ongoing. As you develop a stronger relationship with influencers, the opportunities to capture simple microcontent, longer form content for campaigns and anything in between will widen. Ongoing influencer collaboration on content will rely on shared values and topic relevancy for both brand and influencer as well as how effective the influencer is at creation and promotion. 13. Monitor Your Attract, Engage, Convert Metrics. Data opens the door to content performance optimization. In particular, the data that reflects how effective your content is at attracting the right audience, the experience your content creates for that audience and the effectiveness of your content inspiring action. Active content performance creates efficienceis for your content marketing by identifying what’s working and what is not. As a result, you can make more informed decisions about what BAT (best answer topic) content to scale up, fix or discontinue. As with influencer collaboration, content performance optimization is an ongoing process. That process starts with monitoring your most relevant attract, engage, convert metrics to identify trends and opportunities for closing the gap with your goal performance levels. 14. Adjust Content & Optimization Tactics to Improve. As you identify opportunities, you can take action to improve performance. You may find that a particular BAT is pulling in a lot of organic search traffic, but it is not converting. You’ll want to dig in to the relevancy of the topic for a conversion expectation as well as the content on the associated Power Page and landing pages. 15. Close Gaps Between Best in Class and Your Content. Beyond monitoring your own content is the task of monitoring the performance of competitors’ content in your BAT category. Benchmarking and goals represent the ends of the spectrum for the performance gap you’ll want to close. 16. Test, Experiment and Iterate. Not all answers will be obvious when it comes to optimizing content performance in search, social or for converting customers. That’s why it’s essential that you test. The data you collect from monitoring and subsequent efforts to adjust tactics and close the gap can support a hypothesis for testing. The same goes for experimenting with something new. Document what you hope to happen, implement, monitor and measure. Take note of opportunities and iterate. In an age of information overload, it’s not enough simply to create better quality content. Not only will marketers need to create better quality content, but more of it. Without additional budget or writing resources, the most practical way to squeeze out more content creation productivity is by being more efficient. Hopefully some of these tips will open doors for your creative thinking about how you can operationalize some processes, cross-pollinate others and tap into the resources of crowdsourcing, collaboration, repurposing and optimization to gain the content creation efficiencies you need to be successful. Of course if you would like more content ideas in action, check out these content marketing case studies.